This is the first in what may be a series of words yanked from the mouths of our clients--you know, those that come to visit us on their yachts. "Did you know that oil hit $78 a barrell today? My Texan friends don't know what to do with their money!" -Californian man on vacation with his family, said after he found out I was from Texas. I would suggest that his Texan friends save "all that money." One of the things that I love about Italy is the very short route that products take to travel from the source to the table. Many times it's as easy as reaching up to tree in your backyard to pick a ripe summer peach. Maybe you have a couple of eggplants growing in your garden or you just might know of a secret cove where mussels grow wild and can be scavenged at will. In Italy, if you don't have the fortune of being so close to your produce, you will surely be able to profit from the tree of a neighbor or the knowledge of a retired fisherman. This is my friend Mario's uncle. 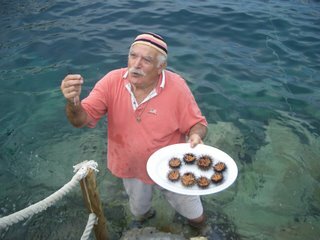 He's retired, but still enjoys fishing for sea urchins and is always ready with a fresh supply of slowly moving, living ricci (sea urchins). As you can see in the water behind him, there are little black spots on the rocks. These are ricci as well, but one must be able to distinguish male (black) from female (violet-red), as the "meat" of the urchin is in the eggs. There was a yacht that came in and wanted these spiny little creatures for spaghetti and Lo Zio brought them, and opened them right up by the sea. Can you see the orange strips? Those are the eggs, and that's what you eat. If my sister is reading this, I'll bet she's fighting back a hearty gag reflex. You know what else Misty (my sister)? They're best eaten raw, accompanied by a glass of white wine and an old clam shell to scoop it all out. Even though she is likely in the middle of a violent stomach spasm, I might be able to convince the rest of you that it is delicious. Trust me. 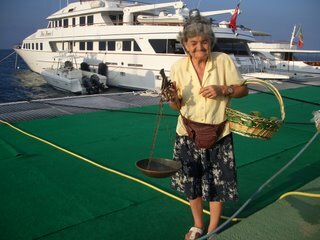 And for those of you who have a less adventurous palate, here's the old Signora who comes by daily to sell her freshly picked fruit. 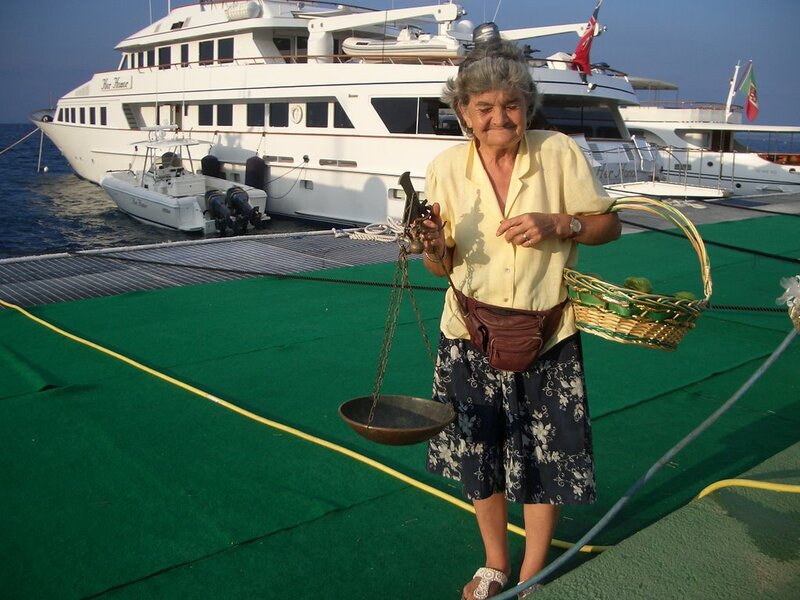 Can't you just imagine a beautiful slice of prosciutto on top of those figs in her basket? YUM. And you wondered why I came to Italy! 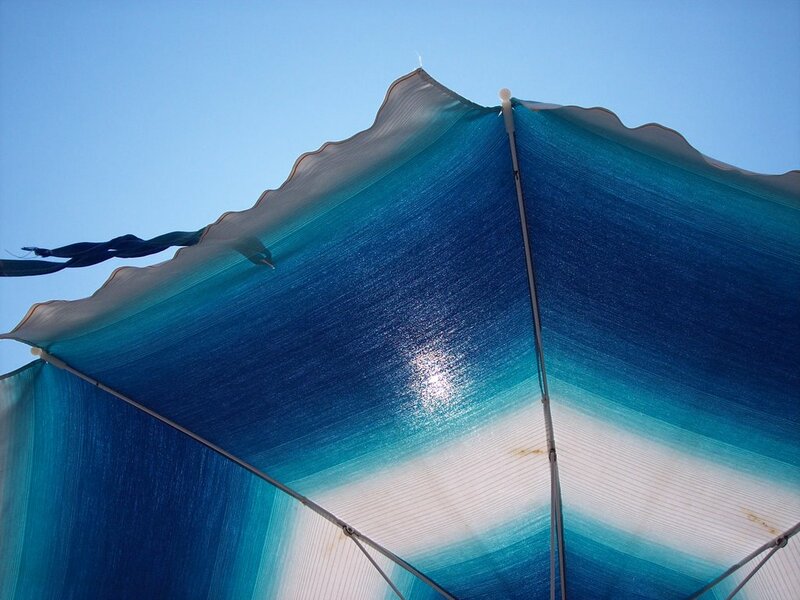 ...island summer! Can't you smell the sea? So, as one would expect from a bunch of excitable Southern Italians, this game against France did not go unnoticed, uncursed, un-gesticulated, and finally, uncelebrated. No, no no. 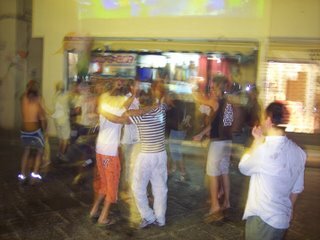 There was screaming, incessant horn-honking, small street bombs, and waving, waving hands--all with a small touch of island mayhem. That's my Italy! 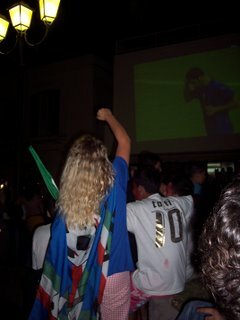 And just to prove to you how much Italians love them some soccer, I took a few pictures. They decided to set up a projector. Doesn't white wash just scream SOCCER? 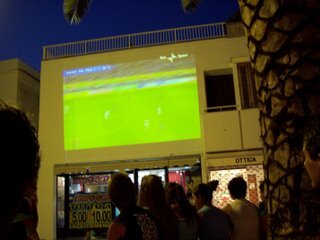 Finally when it was dark enough, they decided to project the game onto the house across the street. Look mom, we won! And there we are, in a state of post-game bliss. 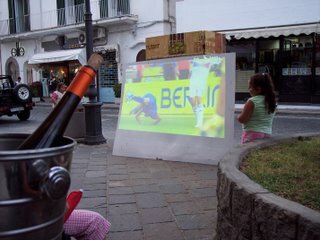 I made friends with a newly-wed couple from London...nothing like soccer and wine to forge new friendships. And there's our Mario, doing his celebratory flexes. 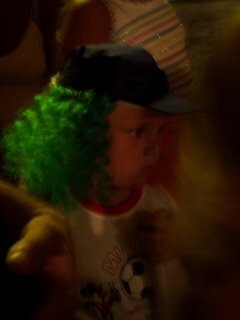 Just look at this little guy and his green and red wig...watching the post-game wrap-up. That's it. I hope to be posting more regularly, I've uploaded some photos into a computer so that should eliminate one excuse. BUT, I'm sure I can find another one, I'm good at that. Anyway, today is also my nephew's 5th birthday. Happy Birthday Brady!! If you want to see a picture of him displaying his superpowers, click here.